One week from now, Canada goes to the polls to select our new federal government. This is, in my opinion, the most important Canadian election since the de facto referendum on NAFTA in 1988. My reason for believing so is that our current government, that of Prime Minister Stephen Harper, has done more to push Canada down the path toward full blown fascism than has any other Canadian government in the post-WWII period. (I add the time period caveat since I would characterize the internment of Japanese Canadians, by the government of William Lyon MacKenzie King, to be this country’s most atrocious fascistic act). I do not use the word fascism lightly. As I do so liberally with respect to Stephen Harper, some have accused me of using irresponsible, hyperbolic speech, and have even cited (incorrectly) Godwin’s Law. Rather, I have come to this conclusion after much consideration. When Stephen Harper was first elected, I actually chastised my Left-leaning friends for their ad homimen attacks on Mr Harper. I essentially argued that we might not agree with his philosophies or actions, but at his heart he is still doing what he believes is best for all Canadians, and therefore was still deserving of our deference and respect. I was wrong and so very naive. I had not yet met members of his caucus, his staff, and his die-hard supporters. And I had not yet taken a close look at his policies and behaviours. Having subsequently done those things, I developed the position that I now hold, which is one of horror. I fear that history would judge me poorly if I do not publicly call this man what he is: a dangerous ideologue with dictatorial reflexes and fascistic tendencies. To those who argue that I should be more deferential to our elected leader, my response is that this is a man who wishes to give himself the unprecedented power to remove my very citizenship and to exile me, due to nothing more than my foreign birth and his own unspecific definitions of “disloyalty.” (More about that in a future blog post). This is also a man who, members of his circle attest, enjoys reading about dictators, and even may model his tactics after some of the most tyrannical, such as Stalin. It is natural , nay required, to question the values and autocratic leanings of such a man. While discussing Harper’s fascist tendencies with others, though, I discovered that many people don’t actually know what fascism is. They confuse it with Nazism, which is but one version. You don’t have to march people to a gas chamber to be a fascist; you just have to show a pattern of controlling, scapegoating, anti-democratic actions, commonly driven by Orwellian doublespeak. To help in my analysis, I searched for a comprehensive list of criteria for fascism. A good one is Naomi Wolfe’s infamous argument that the USA is slipping toward fascism. But hers is not a well researched list. Upon even a cursory examination, it is clear that Stephen Harper’s government satisfies at least 10 of Britt’s criteria, and I am hard pressed to identify another post-WWII Canadian government that equals or exceeds that count. More accurately, what we’re seeing is a desire to associate Conservative policies with nationalism, and a further desire to define Canadian values according to Conservative sensibilities. This in and of itself is not a problematic practice. But it does distinguish this government from its predecessors, who seemed content to let the populace define its own nationalistic limits. And on its own, a mild sense of nationalism is not problematic. It’s when it is partnered with the more ominous items on this list that nationalism’s true venom emerges, as it provides patriotic cover for actions and policies which are brazenly and viciously xenophobic. Some online critics of Britt’s list note that nationalism is a natural trait of all political parties, and would rather that a criterion of fascism be “palingenetic ultra-nationalism“, which has as its heart the notion of national rebirth. Well, I would argue that Harper’s desire to re-define Canadian-ness, either through his wish to deny Canadian status to “disloyal” citizens (Bill c-24), or his desire to dictate how Canadian women should dress (the niqab issue), has more than a sufficient taint of palingenetic ultra-nationalism. More bluntly, his fascist tendency on this front is his insistence on being the arbiter of what it means to be Canadian. That’s not his call. For a comprehensive summary of Harper’s atrocious human rights transgressions, look no further than this article by the Secretary General of Amnesty International, Alex Neve, in which he lists the many reasons that a foreigner once asked him about Harper’s Canada, “What has happened to you guys? I thought you were the human rights good guys.” I will not reproduce Neve’s list here; go read it at the source. Let’s not forget that many of our allies refused to support our bid for a UN Security Council seat, many privately citing our waning reputation as champions of world rights. Whether it’s Harper’s regressive policies with respect to indigenous or refugee rights, or his desire to soften laws against torture, it’s not a surprise that the United Nations Human Rights Committee is not bullish on Harper’s record. One word: Muslims. One other word: Foreigners. Three words: Foreign, Brown Muslims. Two Muslim women sought to give their citizenship oaths while wearing a niqab. This is entirely a ceremonial process devoid of any legal meaning. Yet Mr Harper sought to prevent them from exercising this bit of freedom, wrapping himself in nationalistic fervor and presuming to define Canadian values for the rest of us. Harper tabled Bill S-7 and announced that he would create a national hotline for reporting “barbaric cultural practices” –a patently unnecessary move, given that citizens are already free to report criminal acts using the 911 number. And during a national debate, Harper distinguished between “old stock” and “new stock” Canadians. Some believe this was guarded racist language, while others are more forgiving. The wonks call this “dog whistle politics”, meaning that the true intent of this move is to send a signal to specific groups. Which groups? Racists. People looking to have their bigotry rewarded. Canadians saw right through it (hilariously). Even lifelong, senior Conservative Danny Williams broke ranks and declared his boss’s tactics to be “borderline racist.” (I think the “borderline” part was far too generous.) But this divisive strategy also unleashed the fouler racists in our midst. Troubling tales of attacks against Muslims, especially niqab-wearing women, and including the defacing of foreign-sounding candidates’ names with racist slurs, erupted in the wake of Harper’s tactics. The vilification of minorities, sadly, always works. On one hand, Harper has spent less on Canada’s military than most of Canada’s previous Prime Ministers. On the other hand, as was pointed out during a recent federal leaders’ debate, Harper hasn’t seen a war he doesn’t like. Had he been Prime Minister at the time, Harper would have taken us to war in Iraq. He inherited our war in Afghanistan and doubled down on it. He took us to war in Libya. He wants to take us to war against ISIL/ISIS. The Harper years have been Canada’s most militarily active in living memory. The governments of fascist nations tend to be almost exclusively male-dominated. Under fascist regimes, traditional gender roles are made more rigid. Divorce, abortion and homosexuality are suppressed and the state is represented as the ultimate guardian of the family institution. Sexism is not a feature exclusive to Harper’s Conservatives, but they excel at it more so than other parties. The current Parliament comprises 23.3% women. By party, however, the Conservatives have the fewest women (12.3%) versus 25.6% among Liberals and 35.1% in the NDP. Despite declaring a desire not to bring abortion back to the debate floor, the Conservatives tabled Bill c-484, which provided a loophole for the criminalization of abortion. Earlier this year, the United Nations Human Rights Committee singled out Harper’s Canada for our country’s wide wage gap between the sexes, as it is twice as bad as the global average. And while this may seem like an unfair burden to hang around Harper’s neck, note that in 2009 he gutted the Public Sector Equitable Compensation Act, preventing it from closing the gender wage gap. Canada fell from #1 in the world for gender equality in 1996 to #18 in 2011. In the later part of that decline, Harper inexplicably cut the funding of Status of Women Canada, as well as scores of women’s groups. One of Stephen Harper’s first acts upon becoming Prime Minister was to exclude the Parliamentary Press Corps, the body that serves as the eyes and ears of citizens in our nation’s governing centre. These days, most media outlets are lining up to criticize Mr Harper. So it seems that he does not have them in his pocket. But he is certainly the most press-averse Prime Minister of the modern era. Security is at the heart of Harper’s re-election campaign. His office’s personal intervention in the processing of Syrian refugees was explained as a move to ensure Canada’s security. Harper’s introduction of the racist Bill C-24, which seeks to literally create second-class citizens and create the ability of the government to strip the citizenship and render unto exile anyone non-specifically deemed “disloyal” to Canada. Of course, this draconian retrograde legislation is defended as a “security” precaution, which allows us to be rid of domestic terror threats. Leave aside the bill’s implicit assumption that terrorism must naturally be the product of those with foreign connections, or the fundamental illogic of setting free suspected terrorists to find allies and resources abroad. This bill represents an obsession with the need to solve a security problem which, frankly, does not exist in anything resembling the scale suggested by the Conservative government. Similarly, the passing of Bill S-7 (The “Barbaric Cultural Practices Act”) and the suggestion that Canada institute a “barbaric cultural practices” snitch line, are transparent attempts to both stoke and capitalize on citizens’ fear of foreign threats. Perhaps most blatantly fascistic is Harper’s flagship security law, Bill c-51, which, under the guise of securing Canadians against terror threats, significantly curtails our privacy and opens the door to the legal harassment of legitimate protesters, especially those historically opposed to Conservative interests, such as environmentalists and Aboriginals. It’s a nauseating truism that North American politicians need to express their religious bonafides before ascending to power. This is not a uniquely Conservative or a uniquely Harper attribute. 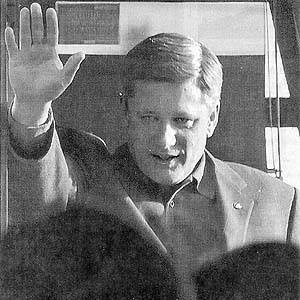 In fact, I give Stephen Harper credit for rarely (if ever) bringing his personal religious beliefs to the public stage. He has also kept to his word about not opening a Parliamentary debate about abortion (sort of, see above) or other religious wedge issues about which Canadians have found peace. A recent study of grants awarded by the Canadian International Development Agency (CIDA), by a political scientist at the University of Quebec, found that money allocated to religious non-profit groups increased 42 per cent between 2005-10, compared to a rise of five per cent for secular NGOs. As well, for the first time, millions of federal dollars have been funnelled into private Christian colleges and universities through the government’s Knowledge Infrastructure Program. And consider this analysis, which posits that Harper’s fundamentalist Christian beliefs taint his environmental and foreign policies. Well, I hold it as a truism that all political power in North America is corporate power. The Left-leaning parties are almost equally as guilty of this. But while this characteristic might not be unique to Harper, he certainly embraces it with all his being. There are too many examples of this to list. But one very important example is that of the new Trans-Pacific Partnership (TPP), which I intend to explore in more detail in a future blog post. Regardless of whether you feel the TPP is a good or bad thing for Canada, one thing is clear: it was negotiated almost entirely in secrecy. Well, pretty much all trade deals are negotiated in seclusion. But this one was special in that some non-governmental forced did have access to the negotiating parties when voting citizens did not. I’m talking about corporate lobbyists, of course. Thus is it not surprising that the TPP has corporate fingerprints all over it, much of it to the detriment of the common citizen. For example, the intellectual property portion requires that Canada extend its copyright limits by at least 20 years. This requirement will cost taxpayers over $100 million per year, and will only benefit corporate copyright holders. In a profoundly contemptuous move against organized labour, Harper tabled Bill c-377, which was based almost indistinguishably on a similar move by that champion of all things hateful, George W. Bush. The bill is being pushed through, despite two bar associations deeming it to be illegal. On its surface, it seeks to make the finances of unions more transparent (not a bad idea on its face); but the same requirement is not made for employer organizations or right wing think tanks. And here is where most Canadians might be oblivious to Harper’s shenanigans. I have colleagues in academia who have been forced into early retirement due to threats from the Conservatives. Unsurprisingly, all of these colleagues were environmental researchers critical of the Harper regime. I, too, was once a Chief Science Adviser with the federal government when Harper first obtained a majority government. Instantly, I was ordered to cease all public opinion research, despite all of it already having been commissioned and paid for. Hundreds of thousands of tax dollars were almost literally thrown away, presumably because the new government feared the data I might collect. Most shamefully is this government’s discontinuation of the long form census, a blow to the foundation of population science so terrible that we might not recover our associated research capacity for at least another generation. I am on record of questioning the ethics of the mandatory census. But Harper gutted the census not for the ethical reasons I explored, but rather to deny independent organizations the ability to accurately monitor the impact of public programs. The absence of a census allows a government to make wild claims about their effectiveness and necessity without the threat of an evidence base. Harper’s war against climate scientists is well documented. Federal scientists are fired at a frightening pace, leading one to conclude that the government is not so much concerned with spinning information as it is with suppressing information. Denial of the census, suppression of research… it seems to be all about empowering the government to make evidence-free policy. Or, more blatantly, empowering them to make policy that they clearly expect not to be supported by evidence. As a scientist, it is profoundly troubling that federal scientists require ministerial permission before publicizing their results. This is contrary to the very soul of Western science, which thrives only in an environment of open sharing. Unsurprisingly, scientists have taken to the streets with placards emblazoned with, “No science. No evidence. No truth. No democracy“. In the words of The Huffington Post, “every week, it seems, the Harper government introduces a new bill or initiative purportedly aimed at making our ‘streets and communities safe'”, with little to no evidence that such bills were needed or that they have worked. Of particular dismay is Bill c-54, which sought to lessen the ability of mentally ill people to use their illness as a mitigating circumstance when committing a crime. One item that is not on Britt’s list of 14 fascism criteria is the utter disdain for the mentally ill that fascist governments tend to display. Our government seems to embrace that same ethic. This criterion does not apply uniquely to Harper, despite the 2011 “Robocall” scandal, as I personally know of several attempts by non-Conservative candidates to discourage selected voters from exercising their democratic franchise. Voter suppression takes on a particularly ominous fascistic taint, though, when it is parceled into an actual legislative act, something I had not observed in Canada until now. A relevant example of Harperian transgression include his failed attempt to prevent long term ex-patriates from voting. More recently is Harper’s bill to strip Elections Canada (the non-partisan body in charge of running elections in this country) of its power to promote voter turnout. Critics allege that this was done to prevent young voters from participating in the current election, as young people overwhelmingly vote against Conservative candidates. Well there you have it. If you still don’t see the fascistic tendencies of the Harper government, then no amount of evidence will convince you. Since writing this article, I found another one online in which someone had also analyzed Harper’s record through the lens of Britt’s 14 criteria. Check it out. Maybe Stephen Harper’s policies have benefited you personally, possibly financially. Please don’t let your good fortune blind you to the damage being done to our country’s intellectual and cultural infrastructure. On Monday, vote with your brain and your heart, not your wallet.